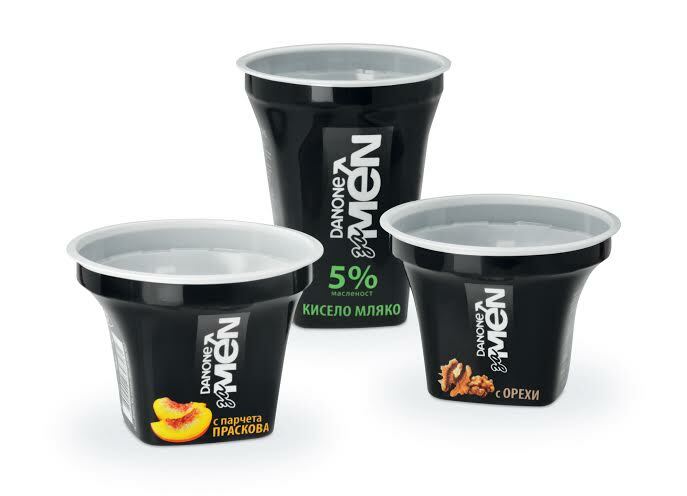 Giant food company Danone launched its own yogurt product line for men in Bulgaria in summer 2013. The successful concept is currently being expanded to other markets. Packaging partner Greiner Packaging emphasizes its clear positioning with stylish, sleeved cups. Kremsmünster (Austria), January 21, 2014 – In a number of studies, Danone Bulgaria concentrated on the taste preferences of Bulgarian men in yogurt consumption. The major findings revealed that men in Bulgaria particularly like yogurt products with thick consistency, high fat content, and a distinctive taste. Natural ingredients were also sought after. These insights influenced the creation of the product line, Danone for Men, which has been a success in the Bulgarian market since summer 2013. Greiner Packaging was commissioned with the packaging concept for Danone for Men. Deep black – a symbol of strength and dominance – dominates the look. The masculine need for clear structures is reflected in a unique cup shape. Straightforward, minimalist graphics appeal to the male aesthetic sense. “The shape of the cup presented a huge technical challenge, especially with respect to the filling process. We’re glad we were able to meet these high demands,” explains Kenneth Boldog, Head of Division K at Greiner Packaging International. The cups for Danone for Men contain 190 or 370 grams and are decorated with a sleeve. Danone for Men fulfills the desire for high fat content in the form of a natural yogurt with five percent fat. Fresh slices of peach and real walnuts are the natural ingredients that also provide flavour. Danone for Men yogurt products are so thick that they may even be consumed with a fork. This feature was also played up as a key message in advertising through the use a fork display as tall as 2.5 metres. Danone Bulgaria also supports the new product line with its own specially designed refrigerators in supermarkets.